I n 2016, cellist Morag Northey approached me for dramaturgical guidance on a work she had in mind, a narrative of her life journey told through the cello with some accompanying narration. Morag had created and performed the cello score for my play Queen Lear some ten years earlier. We knew we worked well together and so it was a natural evolution. When we first met about it, Morag presented to me a binder of poems, song lyrics, prose poems etc. etc. she had written over the years. It was 170 pages! With so much material, and given that the narration would need to be secondary to her cello playing, it seemed to me as long as we were working from that binder that very little would come of it. A few months later, we were invited by Karen Jeffery to develop the work at a residency at the Sunset Theatre in Wells, BC. It was a generous and timely offer. Morag actually forget to bring the binder with her to Wells (thank God, there are no accidents!) and so once ensconced in the Sunset Theatre we began work anew, afresh, unencumbered by that daunting tome of 170 pages. The result of our efforts is a lean script of some 20 pages that provides a narrative through line and offers Morag the opportunity to share her considerable talents on the cello, as well as vocally, and in this manner tell her story. It is titled 17. In performance it is a unique situation where the vocals accompany the instrument as opposed to the other way around. We were invited back to the Sunset Theatre in 2017 to further refine, rehearse and perform the world premiere of 17. It was a beautiful production all around, and anyone who has heard her story and heard her playing at this level has come away from the experience profoundly moved. It’s a powerful piece. I would have thought, ongoing, that Morag would have found a female performer to do the narration, but she likes the male-female balance of energies, and she likes my voice, and so we have performed 17 on a few occasions since our production at the Sunset Theatre. We even made a recording of it earlier this summer. It is a very unique piece, quite unlike anything I have ever seen before, let alone been a part of. It doesn’t really fall into any recognizable categories. Is it a play? Yes and no. Is it a cello recital? Yes and no. Is it performance art? Perhaps. A performance piece for solo cello and voice with accompanying narration might come closest to the mark. Because of its unconventional nature, it’s hard to know where to seek out performance opportunities. We have done a few house concerts, and recently performed at the theatre in Cochrane as guests of the teatro dell eco company there, run by the lovely team of Daunia Del Ben and Lauie Stalker. As always (and if I do say so myself) our audience was profoundly touched by the honesty of Morag’s story and the power of her performance. And so, as you may well imagine, when a performance opportunity comes along, we are loathe to turn it down. We have now been invited to travel to Taos, New Mexico to perform the American premiere of 17 and as it seems such an important step in our journey with the piece, we didn’t feel we could turn it down. The trouble is, financially speaking, we can’t really afford to go there, either. The wonderful group of artists in Taos have offered everything, all of their resources, for us to have a good performance there. But where we find ourselves short is in transportation and actually paying ourselves for our work. The cost of transportation is very high around the American Thanksgiving. If that weren’t bad enough, we have to pay an extra full fare to transport Morag’s cello properly and safely. And so, to make this happen, to be able to share this Alberta-born, BC-produced work of art with our American friends, we have started a GoFundMe page to offset some of our expenses. Thanks so much for your consideration, friends. I know times are tough and money is tight in the arts these days, but we must soldier on. This is a great opportunity to share some Canadian art south of the border, but we can’t do it without your help. 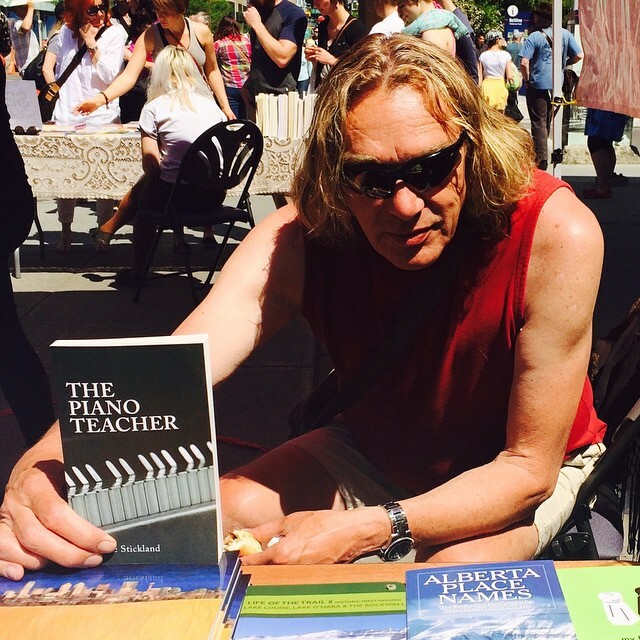 This lovely photo taken by my friend Francis Willey is from the launch of my novel, The Piano Teacher, at Calgary’s Shelf Life Books. 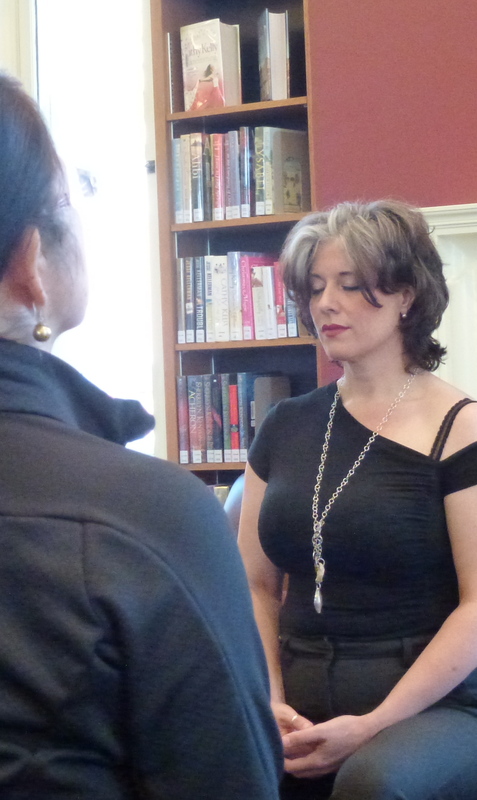 The beautiful woman you see in the photo is Morag Northey, a wonderful cellist and human being who graced us with her presence and made what may have been an ordinary event quite magical. The universe, or God, or god, or the gods, or maybe a simple act of fate brought Morag and I together about 6 years ago when I was looking for a cellist to create a score and perform it on stage for my play Queen Lear. That’s not an easy thing to do, let alone do it well, but she did it and anyone who saw that Urban Curvz production of the play certainly came away from it enriched and even transformed by her infectiously generous spirit that she somehow manages to impart with each and every note she produces. 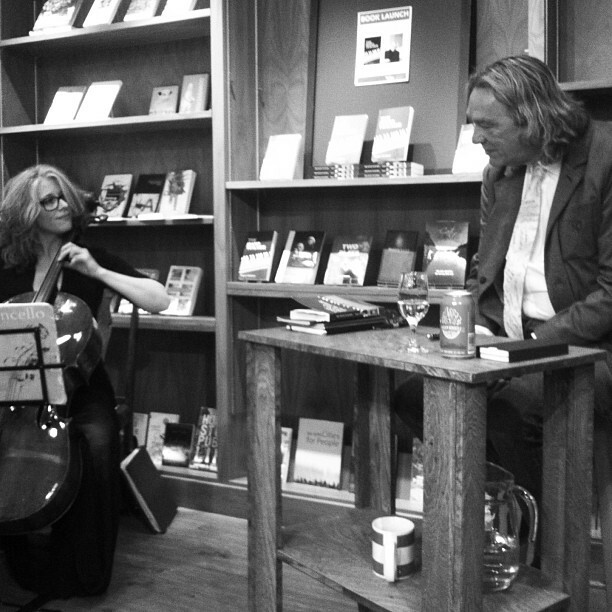 How perfect, then, that Morag offered to play at the launch of The Piano Teacher. If Queen Lear was an exploration of the process of the theatre, then The Piano Teacher is an exploration of the process of music. Among other things, obviously. I began my artistic career as a piano player. When I was young and developing my aesthetic sensibilities, it was all about music, and the act of playing. It really quite amazed me that when I set out to write this novel, which is told from the point of view of a concert pianist, so many of the lessons and ideas learned from my teachers decades ago were still so fresh in my mind, like it all had just happened yesterday. Interesting, isn’t it, what sticks and what doesn’t. When I began writing plays — my first one, The Family, was performed in 1984 in the back space of Theatre Passe Muraille in Toronto — 31 years ago, dear God, where does it go? — I guess I must have felt that words alone were inadequate somehow, never as powerful or as evocative as music. I tried to find a balance between language and music in the medium of the theatre. The odd time I think I may have actually gotten it right. The point being, we had live music on stage. Other plays I’ve written – Quartet, Cocktails (which I edited and contributed a piece to), Excavations, Writer’s Bock and Queen Lear, all featured live music on stage in one way or another. Even my old chestnut, Some Assembly Required, had one of the characters creating the soundtrack on stage by playing a tightly controlled rotation of LPs. Ongoing, I’ve muddled my way through most of a second novel that so far has nothing to do with music. I do have an idea for a play that is about an aging rock musician (see photo below!) but so far that’s just an idea, I haven’t taken pen to paper yet. I do think it interesting to endeavour to probe this antinomy of music and literature.I look forward to renewing the journey again some day. Meanwhile, though I have a novel to flog and it seems to take up a lot of time and energy. I have to say that the early feedback on The Piano Teacher has been so warm and enthusiastic that it’s really been encouraging. Oh, and this. As you are probably aware, artists of all stripes are trying to figure out how we can make a living from our travails in this digital age. Well, a friend of mine put a “Donations” button on his blog a while back and he has made the astronomical amount of $37.00 as a result. So I thought what’s the worst that can happen, and put one on this blog, up on the left hand side. It’s a long summer and any support I receive in this manner will be greatly appreciated. If you can afford to, I would appreciate the support. But really, just knowing there are people reading these ramblings is gratifying in itself. Still, you know what they say — you can’t live on air. I mean to put a permanent link on for buying The Piano Teacher and Queen Lear from Blurb.com, but I haven’t figured out how to do it yet. If you’re in Calgary, you can buy both books at Shelf Life Books, but if you’re further away, The Piano Teacher can be purchased online at http://blur.by/1JCifkt and Queen Lear at http://blur.by/1wf20oo. Here’s a photo of me shilling my book at the Shelf Life sale at The Lilac Festival earlier today. Morag Northey is offering a gift of cello and voice meditations to the citizens of this city. I witnessed her today at Memorial Park Library, but if you wish to experience her performance you will need to go to St. Mary’s Cathedral, Mondays at noon, until the end of April. 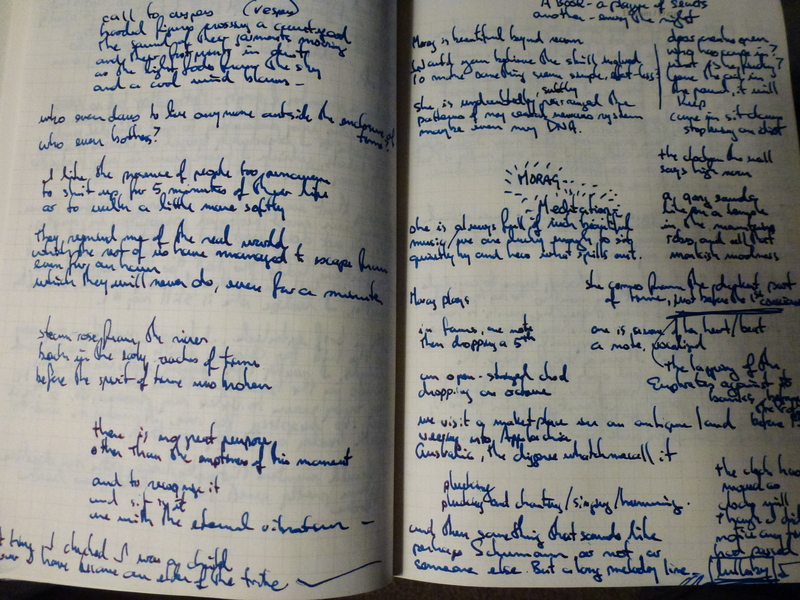 I started out with my notebook and pen in hand, but after not too long I went into some kind of trance. 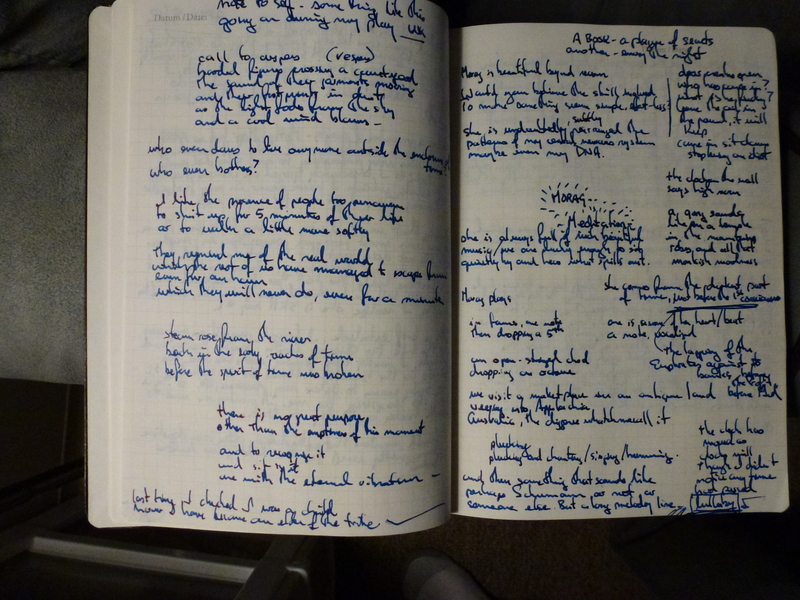 What follows is a transcription of the notes I made and I have included a photo of my notebook at the end of this post. Thanks for reading . . . .
To make something seem so simple and effortless? Who dares to live outside the enclosure of time? So this is a thing. Who knew? The bowl of plenty is full again! Magic! The exciting return of the bowl. Garlic ginger chicken which I made a lot of to share with my students tomorrow. So they know I can cook! An early photo from the Calgary Zoo. I think I was 4 when this was taken. Thé bowl is back! With spaghetti and meatballs from my Abes College student Jessica!